Update: Your wallet isn’t safe! 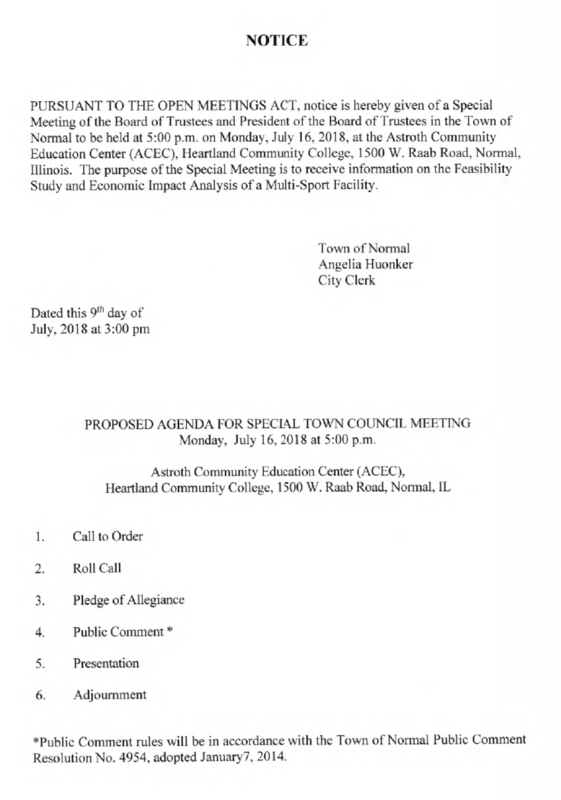 The Town of Normal still does not have this meeting properly posted. They do have the 7:00 pm meeting posted. Their lawyer needs to re-read the Open Meetings Act. The notice below is not posted on the Town of Normal website under agendas or anywhere else I looked. This was sent to me by a citizen. I hope the Town doesn’t consider this their official notice! The Open Meetings Act Requires meetings to be posted where citizens can see it, that would be the place meetings are normally posted. The meeting is being held at Heartland instead of the Council Chambers. It is also being held at 5:00 when a lot of people will not be able to attend. Likely it will not be live streamed. The presentation will likely recommend spending millions for a utopia of sports that will draw visitors from all over the country. Neither Town has the money to spend. Both know where they can get more, they have stolen increasing amounts of your money over and over and over in recent years. Yes, taxes are theft. If the presentation was going to say the market is already saturated with sports complexes and there isn’t a market for yet another one, the meeting would not be held. Meanwhile, the soccer people are raising money for their own complex. New leadership finally asked what the two groups have been doing for years and found out the answer was nothing. Pony League built their own complex with no tax dollars. That complex did not spur economic development in the area even though the parking lot can’t hold all the cars. You can either attend or read what the media thinks you need to know. If you are denied the right to speak during Public Comment because you didn’t advise them in advance, please let me know. Normal’s Public Comment policy is still illegal, it needs to be challenged. I wonder if the Normal Council plans to hold their regular meeting at 7:00? Posted in BloNo, Bloomington, BLOOMINGTON CITY COUNCIL, debt, Koos, Liberal Media, Local, Normal, Progressives, Renner, Taxes.Tagged economic impact, Normal Town Council, sports complex. If it’s such a great idea, why are leaders scheduling meetings when they know attendance will be low? And not using their media pals to talk it up? Hmm…Anyway, the soccer people are raising money to provide some political cover fire. It’s just for show. Those opposed to this complex (I and likely most of you) called them out on this point years ago. They’ll get some “pledges” and then roll the money into the league budget after Koos and Renner put us taxpayers on the hook. State Farm was just featured on the WARN notice for nearly 400 more job cuts. Insiders say that there’s no plan beyond 30 or 60 days out at any given time. Koos and Renner, especially, need to start dealing with our local economic and workforce issues, rather than these white elephant projects which will lose money and cost us precious time to fix what ails are floundering local economy. Did you notice very few State Farm layoffs have entries on WARN? Yup. They do relocations and have had 1,000s of losses through attrition in BN, which may allow them to sweep the true numbers under the carpet. Of course, the local media and our so-called leaders are letting this go unchallenged. It never ends. They are going to talk about “economic impact.” Will they be including “fiscal impact”—the cost. Has the infrastructure for the Metro Zone been recouped? What about the City’s investment in the outlet mall? Has that been recouped. Bloomington wants to expand O’Neil pool into a water park needing $10M of bonds. Taxes will have to increase to secure the bonds. There is no $$ for any of this. No $$ for routine capital improvements. They want to force the implementation of the Downtown plan. They’re completely out of touch with reality. I am so frustrated and angry. So much staff time wasted on these massive special projects when the time should be spent recruiting businesses instead of trying to make Bloomington a tourist destination, which it will never be. Previous Post County holds an illegal meeting!